Capacitance based pressure transducers provide many benefits over other technologies. 8 features that should be considered when choosing a pressure transducer are accuracy, minimal mechanical motion, range capabilities, long term stability, high-level output, media compatibility, electromagnetic compatibility and resistant to harsh environments.. Depending on application requirements, Setra transducers can provide accuracies as high as ±0.02% Full Scale (FS). Such precision, not attainable by many other transducer types, is particularly useful in test-and measurement applications, barometric standards transfer, altimetry, etc. Cross-section of Setra’s Model 239. Its unique, thermally-stretched diaphragm combines high sensitivity with optimum accuracy (0.14% FS) and thermal characteristics. A measurable voltage change is produced by a very slight change in capacitor plate gap. The extremely small deflection of Setra sensor diaphragms helps to minimize hysteresis and repeatability errors and to provide very fast response times. Setra transducers provide an unusually broad selection of pressure ranges. Pressure from 0.05 in W.C. to 10,000 PSIGcan be measured accurately and consistently. All Setra transducers are designed and specified to maintain accuracy settings longer than competitive units. 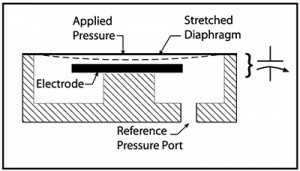 Unlike sensors such as bonded strain gauges, capacitive transducers exhibit extremely low creep, aging effects, humidity effects and other common enemies of output stability. Setra transducers provide long-term zero stability as low as 0.05% FS/yr. Setra transducers need no signal amplification. As a result, they avoid problems common to low-level output devices, such as piezoresistive (thin film and IC) types. Such problems normally include poor long-term stability, thermal instability, high RFI susceptibility and humidity effects. All wetted parts of Setra sensors are either of stainless steel or tough ceramic material. As a result, they can handle a wide range of difficult fluids, including acids, salt solutions, corrosive gasses and liquids with high particulate content. Setra’s sturdy metal cases, shielded cables and careful construction, together with the high-level output characteristic of capacitive sensing, ensure high immunity to external radio frequency and electrostatic discharge interference. Similarly, they are essentially immune to radio frequency interferences emissions. Setra’s transducers are tough! 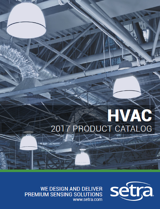 Those models designed for industrial use are specified to withstand a minimum of 10 million full scale cycles with specified accuracy and thermal performance. When they are installer per ANSI B40.2 applying a maximum of 75% F.S. pressure, they will exhibit unlimited cycle life. What’s more, all industrial units are certified to between 100 G and 200 G shock loading, and can withstand vibration at minimum peak amplitudes from 10 G to 20 G.
CLICK HERE to read more about Capacitance Based Pressure Transducers.